You need a decent ski goggle, no matter your experience level or available budget. A good ski goggle should be able to allow you to see the environment regardless of the condition. It is also a very important safety feature, as it protects your eyes against heavy wind current, dust, snow, and impact. One of the most trusted brands of ski goggles is Oakley, and in the following article we are going to discuss about two Oakley models, which are Oakley Airbrake and Oakley Flight Deck XM. Indeed, the Airbrake is more expensive, but this model comes with two interchangeable lenses. Continue reading below for the detailed comparisons between Oakley Airbrake vs Flight Deck XM! Both Oakley Airbrake and Oakley Flight Deck XM are considered compact by many people. However, the Airbrake is a little bit bigger and heavier. The differences in the dimensions are not very dramatic, actually, but the outriggers of the goggle make it appear somewhat bulky. You can say that the Flight Deck XM is the more compact one of the two. So, if you really prefer a neat and compact ski goggle, Oakley Flight Deck XM would be a more suitable choice. Anyhow, both goggles are very comfortable to wear. Each of the two models comes with a flexible O Matter faceplate and Rigid O Matter strap for a snug yet comfortable fit. Note that Oakley Airbrake is slightly bigger, so it may not fit a tight helmet. 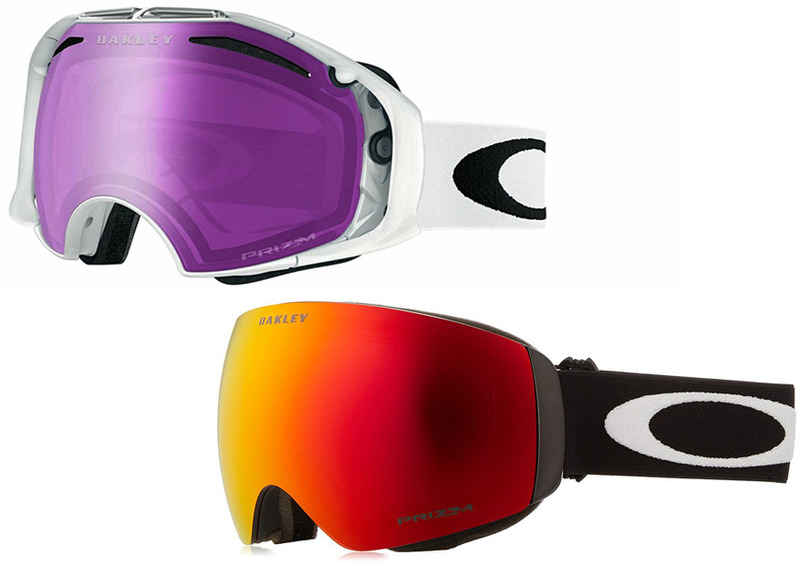 Take a look at our previous post about Oakley Splice vs Airbrake here! Oakley Airbrake features a very nice lens changing mechanism. It is equipped with the Switch-Lock Lens Technology, which brings a lens mount that is secured by a simple yet effective switch. With this technology, you can change the lens of the goggle very quickly. You just need to move the switch, replace the lens with the other one, and put back the switch to the position. If you often need to change your goggles or lenses to adapt to different environment conditions, this lens system will be a great help. You can also replace the lens of Oakley Flight Deck XM, but the process takes a longer time because it is not equipped with the new lens system. Many users agree that the lens changing process is easy, but still, it is not as quick and efficient as Oakley Airbrake’s lens system. The next thing that you need to consider when choosing between Oakley Airbrake vs Flight Deck XM is the field of view. Both offer decent performance in this aspect. But the field of view of Oakley Airbrake is slightly narrower due to the outriggers. The peripheral vision is more limited. On the other hand, Oakley Flight Deck XM comes with a streamlined frame and outrigger design. The lens is mostly rimless. As a result, it can provide more peripheral vision. If you can benefit from the quick lens changing mechanism, choose Oakley Airbrake. This model is very practical if you often need to use different goggles or lenses to adapt to different conditions. However, if you think that you don’t need to swap your lens every so often, you can choose Oakley Flight Deck XM, which offers slightly better peripheral vision and a more streamlined design.